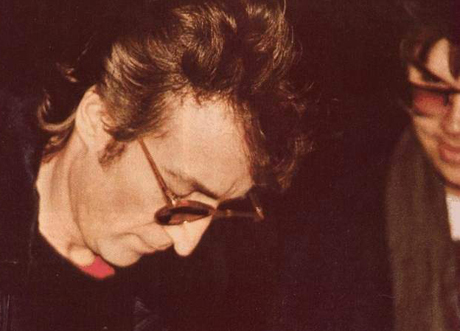 It's one of the most sinister stories in rock'n'roll history: on the same day that Mark David Chapman murdered John Lennon, the killer got the Beatles icon to sign his copy of the Lennon album Double Fantasy. Now, Chapman's autographed LP is up for sale for $850,000. Lennon signed Chapman's album just five hours before the murderer shot him four times in the entrance of the Dakota building in New York. Chapman's fingerprints were on the LP cover, which was used by the police as evidence. The album is being sold through the memorabilia dealer Moments in Time. According to the listing on the dealer's website, "The cover and dust jacket contain forensically enhanced fingerprints of Chapman." It comes with police reports and a letter from the district attorney, written after the murder investigation was concluded. "We are very excited to bring such a historically significant piece to the market," said Moments in Time spokesman Bob Zafian. "I have never come across a piece with such provenance." For 19 years after Lennon's death, the album belonged to a man who found it in a flower planter just outside of the Dakota, where Lennon lived. This is the second time this item has gone up for sale, as it was originally sold back in 1999. Thanks to the New York Post for the tip.